The Eastern Kingbird is a medium-sized dark gray and white flycatcher that, despite its common name, breeds abundantly west of the Mississippi River as well as throughout eastern North America. It forages from high perches, such as the top of live or dead trees, fence posts, or utility wires, often returning to the same perch after flying to catch an insect. It is a long-distance migrant wintering from northwestern South America throughout the Amazon basin. While the Eastern Kingbird aggressively defends its nest and mate during the breeding season, it usually travels in flocks in the winter. The Eastern Kingbird is usually present in Tennessee from early April to late August. Description: Identified by contrasting dark gray upperparts and white underparts. The most distinctive field mark is the white band at the tip of the black tail. There is a small crown patch of red, orange, or yellow feathers, but this is usually concealed and very rarely seen. The sexes are alike in plumage. Males tend to sit more upright and often keep their crown feathers in a slight crest. Voice: The song is a buzzy, almost electric-sounding, series of short stzee stzee notes, or a repeated tiki tiki tiki. No other North American flycatcher is entirely dark gray above and white below, or has a white terminal band on the tail. Habitat: Breeds in open areas including fencerows, grasslands with scattered trees, orchards etc. Winters in edge habitats usually near rivers, lakes, and in the canopy of tropical forests. Diet: Flying insects, fruits especially in winter. Nesting and reproduction: Both male and female aggressively defend territories, often returning to former territories in subsequent years. Clutch Size: Usually 3 to 4 eggs, with a range of 2 to 5. Incubation: Female incubates the eggs for 14 to 16 days. Fledging: Both parents feed the young, which leave the nest after 14 to 17 days. The young remain with the adults for up to 5 more weeks. Nest: The female, escorted by the male, builds a bulky cup nest in a tree or shrub adjacent to an open area or over water. The average nest height in Tennessee is 20 feet, with a range of 3 to 65 feet (that highest nest was on a high voltage transmission tower). 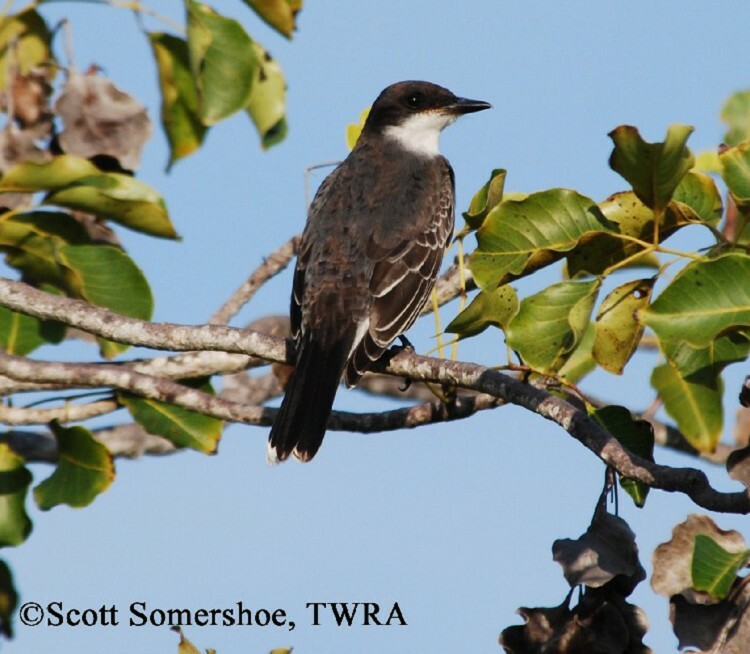 Status in Tennessee: The Eastern Kingbird is common during the summer at low elevations across Tennessee. They arrive in early April and depart in August to early September. Their numbers appear to be declining in the state. Eastern Kingbirds are notoriously aggressive toward larger birds and potential nest predators. Kingbirds are regularly seen chasing and attaching hawks and crows. Once a kingbird was observed to knock a Blue Jay out of a tree and cause it to hide under a bush to escape the attack. During the breeding season, Eastern Kingbirds are highly territorial and mostly eat flying insects. In the winter in South America, they travel in flocks and eat fruits. The oldest known Eastern Kingbird in the wild was 10 years, 1 month old. Best places to see in Tennessee: Found in every county of the state, especially in more open areas along rivers and in old fields and hedgerows. Murphy, M. T. 1996. Eastern Kingbird (Tyrannus tyrannus). The Birds of North America, No. 253 (A. Poole and F. Gill, eds.). The Academy of Natural Sciences, Philadelphia, PA, and The American Ornithologists' Union, Washington, D.C.